How Far Can Your Content Reach? The Sociabble platform boasts many features that allow administrators to track and evaluate advocates’ sharing activity, as well as the diffusion of company content. One of the most valuable is the Hot Posts functionality. It allows administrators to identify the posts with the greatest engagement across all social networks; and the results of the content reach for those posts. 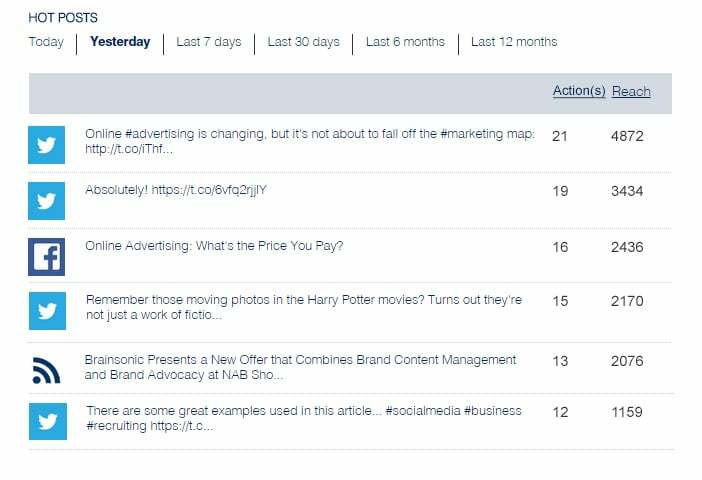 The Hot Posts feature enables administrators to view top posts on a daily, weekly, monthly or annual basis. After selecting a time frame, administrators are presented a table that displays the top, or “hot” posts, for that period. Administrators can choose to display Hot Posts in order of actions generated or reach obtained. After all, the posts that generate the greatest reach are not always those with the most shares. The reach generated by a single sharing action is determined by the number of connections the advocate has on the social network where they choose to share. Take the example shown below: if an advocate were to share ‘Online Advertising: What’s the Price You Pay?’ on Facebook. If they had 300 Facebook connections, the Hot Post would then generate 17 actions; a total reach of 2736 people. Successful brand advocacy is not just about generating high engagement among advocates. It’s also essential to know how advocates’ sharing activity is boosting the reach and visibility of company content across all social networks. This is why Hot Posts are such an important feature of the Sociabble platform. They provide administrators with concrete data that illustrates the correlation between the advocates’ engagement and the larger effect it has on social media.